So, I just walked home from work. You may remember that I live in Little Italy. You may also be aware that Italians are keen on soccer. And you might know that Italy just secured a place in the World Cup final. Put the location, passion and timing together and you just might get mayhem on a big scale. 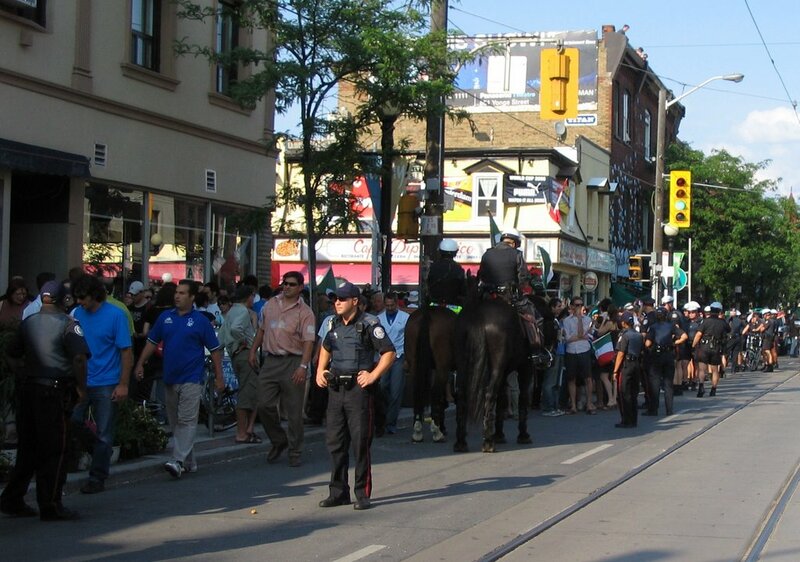 That's the intersection where I live - the unofficial centre of the Azzurri celebrations. Police are trying to control the craziness from horses, cars, bikes and motorcycles. Beyond closing the street down, they weren't having much impact. Anyway, I don't mind all the noise and crowds but I could certainly do without being buzzed by a half-dozen news helicopters, which is what's happening right now. I mentioned in an earlier entry that I hoped Italy would do well. Besides enjoying hotti Totti, I can't help but laugh at all the drama queen antics. However, I wasn't laughing quite so much when the bella donna routine was used to scam a penalty kick in the final 12 seconds of normal play against my home country. "It's a bloody outrage!" Still, the fact is that Australia was playing 11 on 10 for 50 minutes and couldn't find a goal so let's not pretend that the Socceroos were totally robbed. What a shock to see Brazil go out too, although they were not overly inspiring in the earlier rounds. I will miss seeing Ronaldinho play - there's a guy who doesn't hide his love of the sport and who gets that underneath all the pomp and grandeur, it's just a game. -A girl out celebrating Italia this afternoon wearing a t-shirt which read "WOPS ARE TOPS"
-Two supermarket stock boys having a shouting match while unpacking flats of strawberries. The fight was about whether Greece or Portugal was the better team. Dude, give up! Greece didn't even qualify! -In between all the cars flying national flags, I spotted one with the skull and crossbones pirate flag. Can you imagine the fouls a team of pirates would commit? I'm a fan already. If I had a car, I'd totally stick a pirate flag on it. 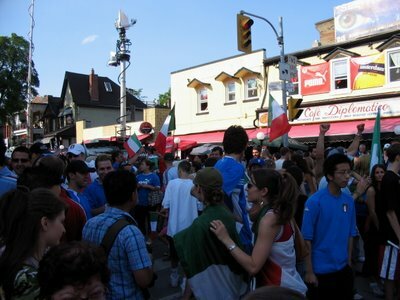 -Amidst all the frantic flag waying, whistling, honking, screaming, air horns and wild blue-jerseyed fans on College Street today, a woman on a bicycle asked no-one in particular, "Did Italy just win?" There might be more than one pirate team supporter because I saw some skull car flags for sale this weekend. Love your new blog, Meghan! It's going on the link list right now. thanks for the links andrea!